Finding the maximum forward speed is a risky, manual process. Vectored thrust on multirotors is uncommon, but not new. Still, this idea has a singular purpose which makes working out the details and controls a bit easier. I settled on a tricopter design because I liked the idea of yaw (rotation around the Z axis) control being completely independent of the individual motor speeds. Otherwise, vectoring the front motors forward is going to have some weird roll/yaw side effects. 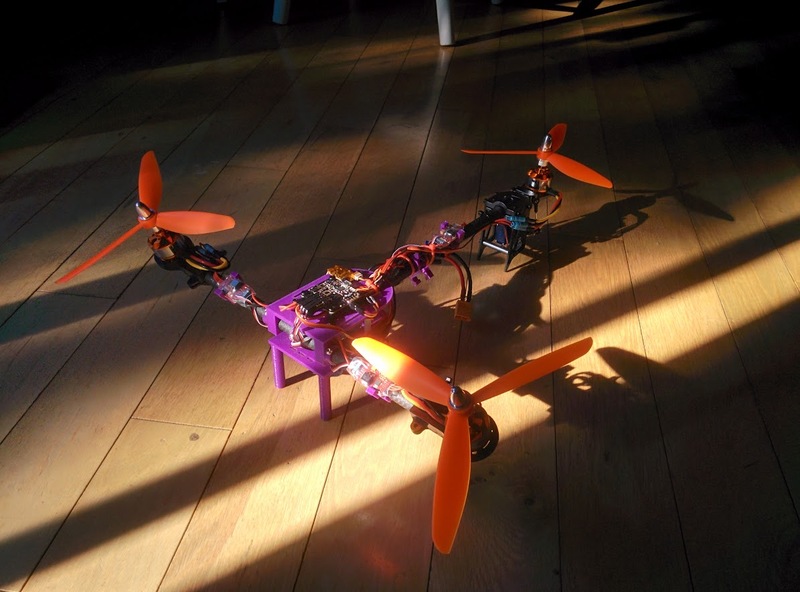 Tricopters don't alter the motor speeds for yaw. Instead, they vector the tail motor on the Y axis to rotate the aircraft around the Z axis. For the thrust vectoring, I decided the simplest design would be to mount the front motors on a single shaft running along the X axis at the front, and then couple that shaft to the airframe in a way that allowed a servo to rotate it - effectively pitching the front motors fore and aft. DISCLAIMER I: This is a largely unproven design. It needs some improvement. I hacked it together in a couple of weeks as a proof-of-concept. I'm only sharing it because in spite of these facts it worked better than I expected, and I've had lots of people ask me for the build details. DISCLAIMER II: This is not a beginner project. I do not recommend undertaking this if you aren't already familiar with RC TX/RX hardware, flight controllers, ESCs, and the like. I'll list the parts, but I unfortunately I don't have time to write a walkthrough or answer questions about the basics of multirotor construction / configuration / flight / &etc. In each case I positioned the part first, then drilled the hole (in each side separately if necessary), then threaded the screw through the part and tube together. The main motor arm is 290mm long because that was the longest length of a broken 500mm tube leftover from a crash that I happened to have on my bench. It seems to work well, but that size is fairly arbitrary as it was determined by chaos theory, not computation. MORE TO WRITE ON THIS SOON! I changed the channel map put AUX3 on the elevator (pitch) stick, and pitch on the AUX3 channel. I put the FC in 'ANGLE' mode at all times so it will hold the craft level when I actuate the thrust vectoring. This allows me to adjust the pitch with the AUX3 knob (as a result of the remapping above) and control the forward/reverse vector with the elevator stick. You could accomplish something similar without modifying the FC software by using a traditional R/C receiver and connecting "ELEV" from the RX to the vector servo instead of the FC. Just be sure to put the FC in "Angle" mode since you won't have any pitch control unless you connect an analog AUX channel to the FC Elev input. It's lighter, simpler, and has a larger range of motion than that mechanical design from the Turnigy Talon. I've got the electronics together for the EDF build, but I'm unsure how to proceed with flashing the KK board. NB: It's the vectoring I'm not so sure about here. I feel lost! Every time I spent a few hours no it, I find the solutions to your work hehe!